it’s been months since I updated this blog, not because I wasn’t eating but mostly because I haven’t been cooking at all, with an exception of one meal that led to a night of Tequila and booty shaking. If you know me you know how rear it is for me to go more than a few days without cooking, it’s now getting closer to be two months… but I am still eating, and photographing it ! A recent day trip to Jerusalem will be a good place to start, we made two stops, first at Russel’s Bakery where I spent a few hours shaping loaves and learning a little about the process of bread making that I am so deeply interested in. Then, the Iraqi market where we had some delicious food before buying a ridiculous amount of vegetable, with a clear intention to cook. so far I made one salad consisting of a tomato, a cucumber and a radish…. but it’s only been 3 days so there is still hope. Russel is a native South African that decide to learn the art of bread making and traveled the word to study recipes and techniques. 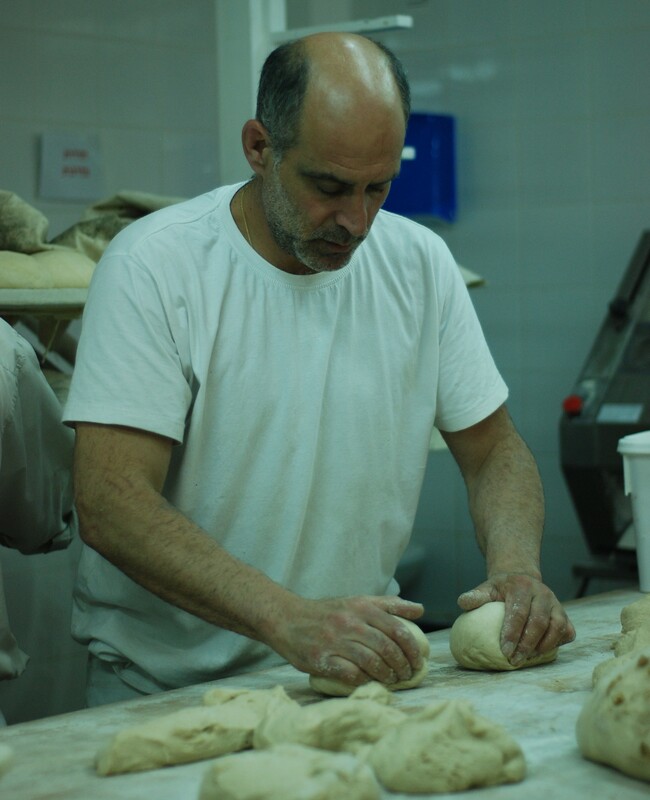 He opened a small bakery and shop near the Shuke in Jerusalem, and everyday before 4am he starts cutting and shaping, baking and loving his bread. A true artist and an inspiration. Russel is working a two hand rolling. What a way to spend a day off! Thank you Russel for letting me get my hands dirty and play with some walnut dough. oh my god, these are the yummiest little things!!! Amy B was here this weekend for a very short minute, and that was a great reason to cook and celebrate. On Sunday as a part of our way to convince Roi to come and help us with an ongoing bathroom renovation, and since Amy was in town, I cooked an elaborate brunch featuring these little cheesy puffs, called gougères, savory cheesy pastry puffs. oh my, they are so delicious. Being the gruyere lover that I am its sorta hard to be objective about any food that has this fantastic swiss work of art in it, but pairing these little yummies with some poached eggs was simply delightful, and it didn’t require too much work either (it is rare for me to go for recipes that do…). It doesn’t require using a mixer, nor it won’t break your hand mixing it. pre-heat oven to 425°F (220° C), line 2 baking sheets with parchment paper. in a saucepan over medium-high heat, combine the butter, salt, white pepper, cayenne, and 1 cup (8 fl oz/250 ml) water and bring to a boil. cook, stirring, until the butter melts, 3-4 minutes. Add the flour and, using a wooden spoon, mix vigorously until a thick paste forms and pulls away from the sides of the pan, about 3 minutes. remove from heat. break 1 egg into the pan, using the wooden spoon, beat it into the batter until combined. repeat with additional 2 eggs. whisk in 1 cup (4 oz/125 g) of the cheese. dip a teaspoon into a glass of cold water, then scoop up a generous teaspoonful of the batter and push it onto the prepares baking sheet with a fingertip. repeat with the remaining batter, spacing them 2 inches (5 cm) apart and dipping the spoon each time to prevent sticking. brush the tops off with an egg and sprinkle with the remaining of the cheese. Another pound of Chestnuts miraculously found its way into my kitchen, it seems like that is all I want to eat this days, chestnuts and soups. There is something so comforting about roasting chestnuts in the winter, and the fact that they are so cheap right only makes it easier for me to buy them. 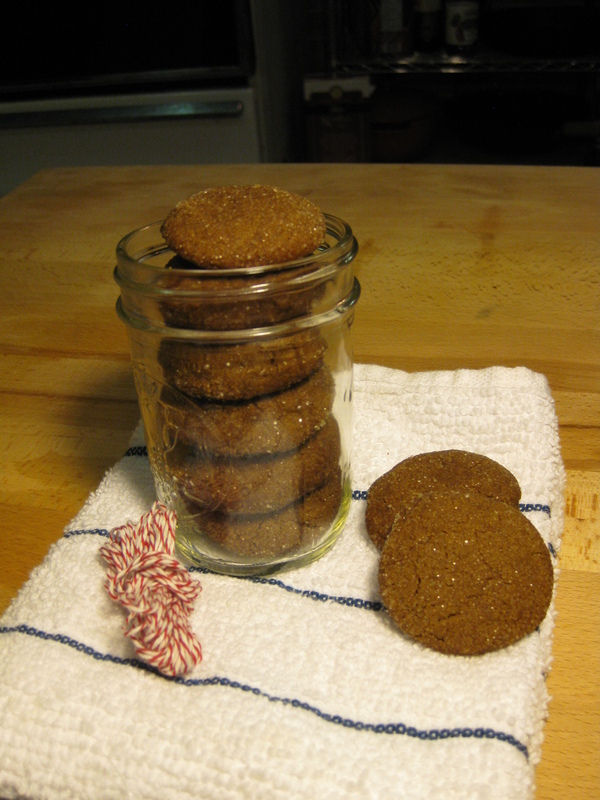 I saw this recipe last week, when browsing through the smitten kitchen, and been dreaming of these cookies since. 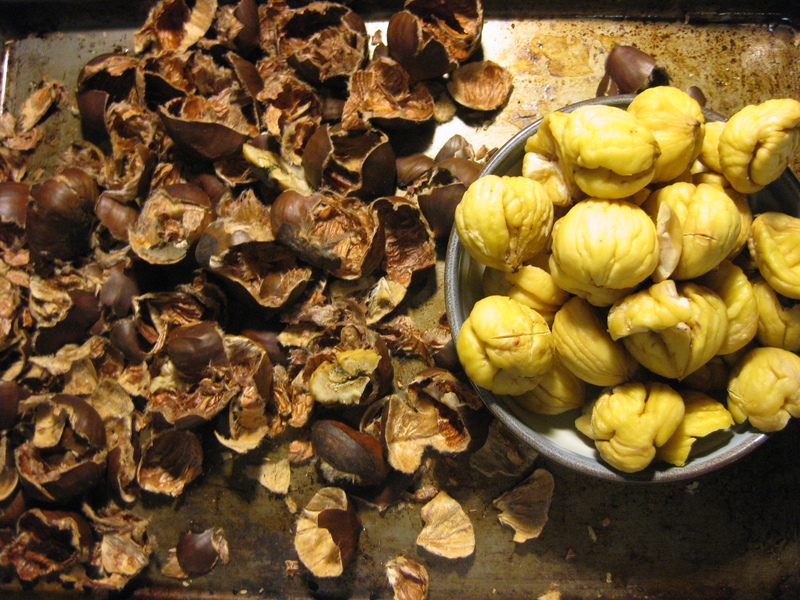 I always favored food that requires some sort of getting your hands dirty, some peeling action, breaking and cracking, and chestnuts are exactly that. In the last few weeks, while slowly realizing I’m obsessed with chestnuts, I noticed how easy it is to over roast them, at least two batches were dried out because I left them in the oven too long (thankfully they are only $3 a lb these days), but 20-25 minutes, on 450°F is all it takes, you can also shake them once or twice while roasting, to get an even spread of the heat. A shallow X cut on top helps you to later crack and peel the skin off as it will start rolling back during the roast. Start with a pound of chestnuts and cut an X on top of each one, with a sharp knife or a bread knife, try not to cut too deep into the “meat” but deep enough that the skin will peel back while roasting. 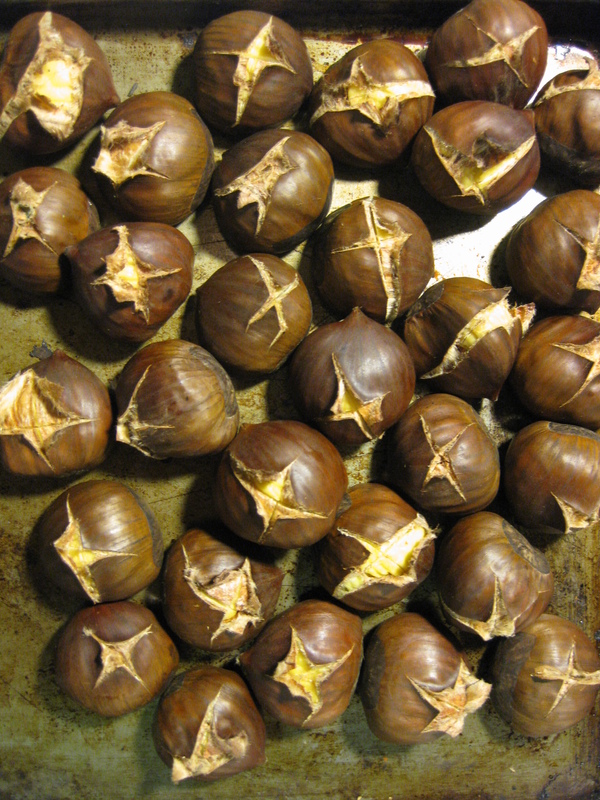 Start with a pound, even though you will need less for the recipe, sometimes the chestnuts end up having rotten middles. After roasting, let them cool and then peel them, chop coarsely and measure one cup, place in a food processor and pulse until very fine, add 2 sticks of soft butter and pulse to combine, add 1/2 cup powdered sugar, 2 teaspoons vanilla extract, 1/4 teaspoon cinnamon, 1/8 teaspoon salt, a few fresh shavings of nutmeg and 2 cups all-purpose flour. pulse until even dough is formed. If you don’t have a food processor chop the chestnuts as fine as you can, whip the butter and sugar in a mixer bowl, add vanilla, cinnamon, nutmeg, salt, chestnuts and flour and beat to form dough. Divide the dough and wrap each half in plastic, cool in the fridge for about an hour. Preheat the oven to 350°F . Working with each half of the chilled dough at a time start rolling out balls, about two teaspoons in size and place on a baking sheet, they won’t spread so you don’t have to leave more than 1/2 inch between the cookies. Bake for about 14 minutes, until just lightly golden in color on top. The cookies will very easily go from buttery and creamy to dry, so be careful not to overbake them. I always like testing out 2 or 3 first, every oven is different and many times I find that I need to adjust the baking time or temperature from the original recipe. 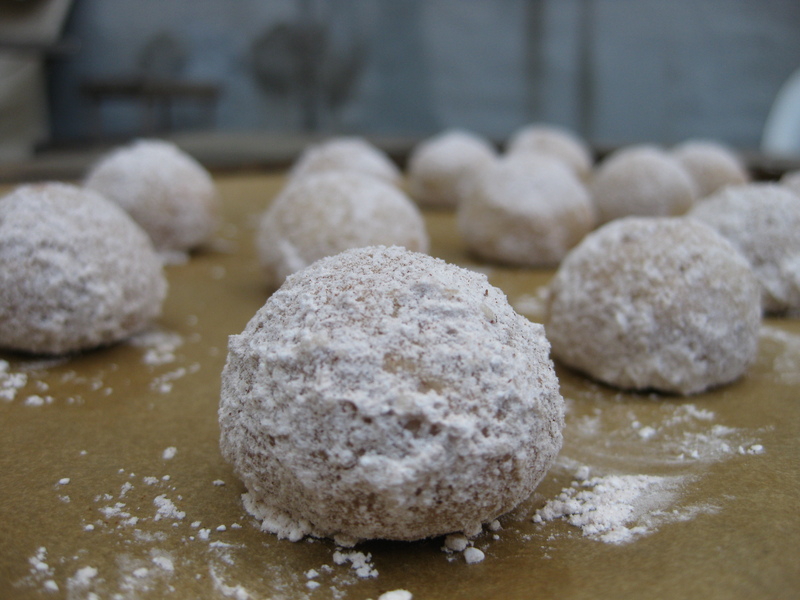 Let the baked cookies cool for 5 minutes on the baking sheet and then roll them in 1 cup of powdered sugar mixed with a few pinches of cinnamon, and allow to cool completely. Be aware! These cookies are a buttery creamy goodness and they are addictive (I had 5 while writing this, 3 more when taking pictures and 2 just because). Taking a baking sheet full of hot cookies out of the oven beats opening a package of cookies, every time! If you didn’t notice it until now, I love simple recipes, it doesn’t appeal to me to bake a cake that calls for 8 hours in the oven or that is so complicated you must follow a long list of specific directions. I like simple and delicious food, now that being said, I don’t mind working hard for good food, I just believe that a difficult recipe does not necessarily produce a good meal. 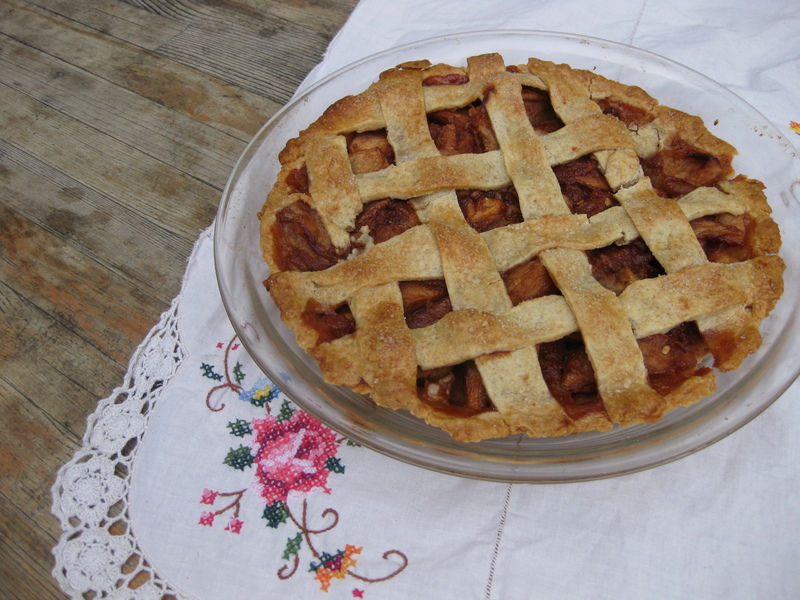 * The recipe below is modified from a few different recipes I found online, Martha’s recipe and Brenda hall’s were the most influential. In a medium bowl, mix together the melted butter, 1 cup sugar, and egg until smooth. Stir in the molasses. 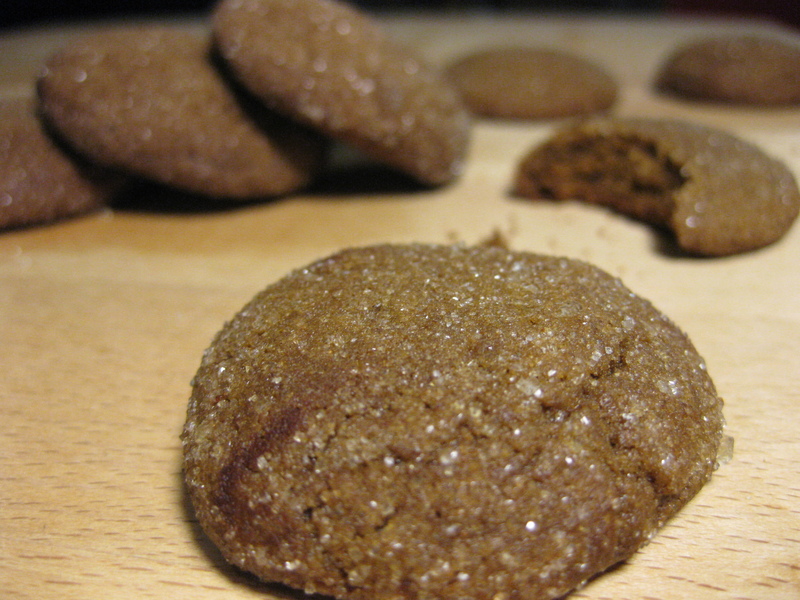 In a bowl combine the flour, baking soda, salt, cinnamon, cloves, nutmeg and ginger; blend into the molasses mixture. Cover, and chill dough for 1 hour. Preheat oven to 350 degrees F (175 degrees C). 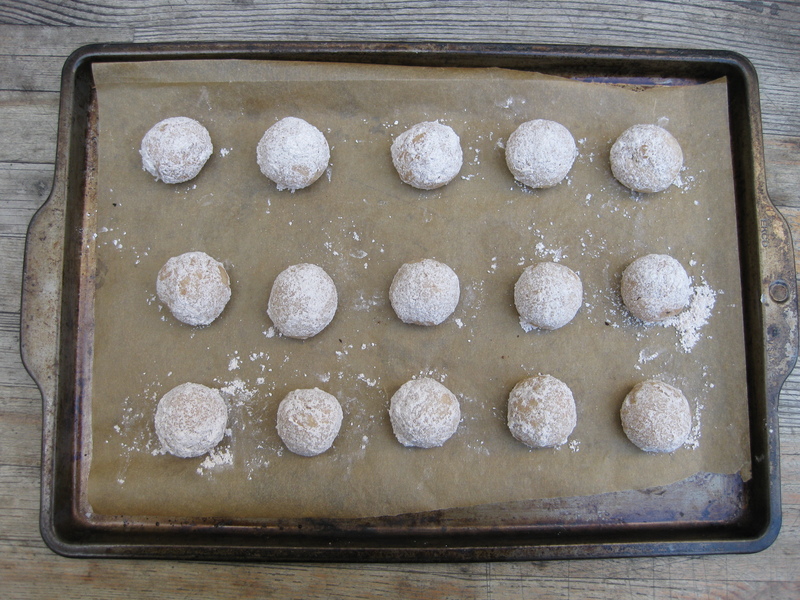 Roll dough into walnut sized balls, and roll them in the remaining white sugar. Place cookies 2 inches apart onto ungreased baking sheets. 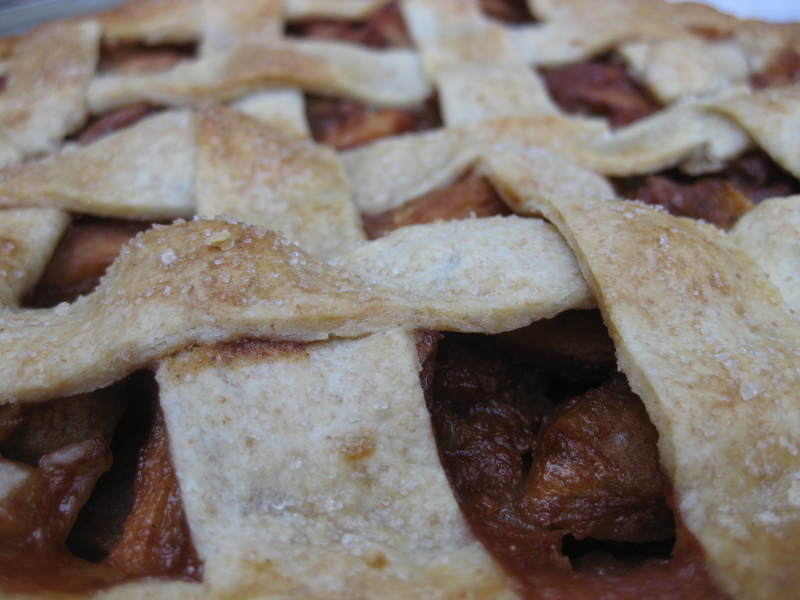 Apple pie is a quick and easy desert that I always love making, and I love it even more now that I have a kitchenaid and I can make a crust in 5 minutes. That was pretty much the first thing I did this morning and it came out perfect. I just love easy, delicious food. in a mixer bowl mix all dry ingredients together until combine, add butter and shortening and mix on low-speed until butter pieces are pea size. add milk slowly and mix until dough is formed. Do not over mix! Divide the dough to two pieces, wrap in plastic and let rest in fridge for 15 min. Last Night we had Aoife and Greg over for dinner, on the menu: some bread, cheese and olives, baked asparagus, chicken in red wine and chestnuts and potato cakes (latkes). 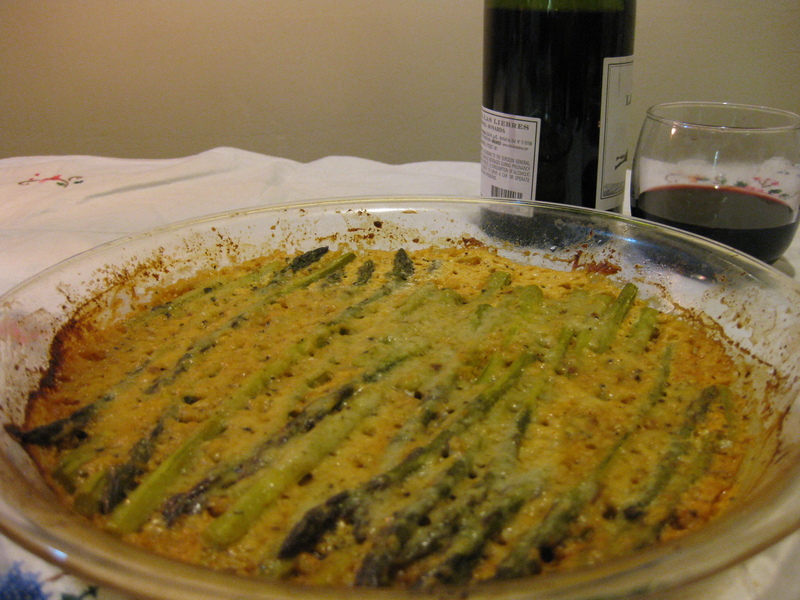 Baked asparagus is one of the easiest side dishes to make, and it is always delicious. 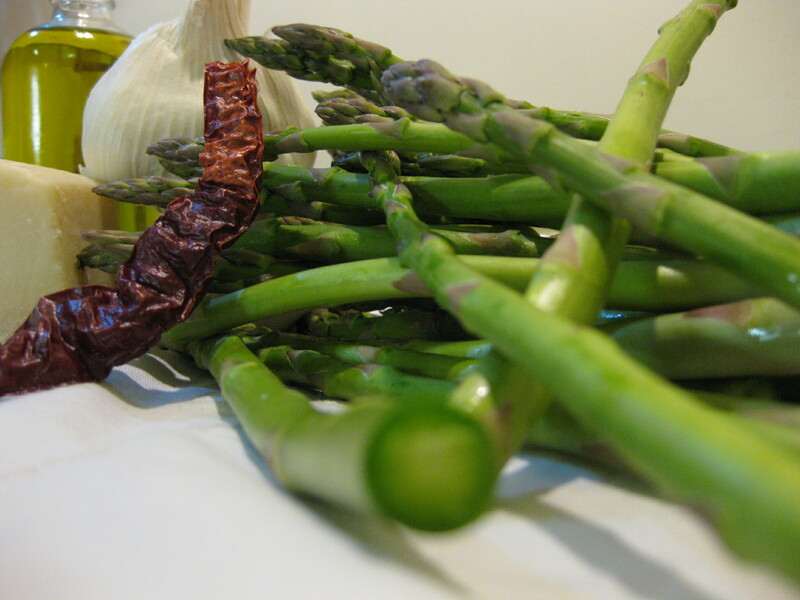 Aside from the fact you have to peel the skin of the asparagus, a task that can get a bit tedious at times, it is a quick and easy winner. In the spirit of Channukah we also made some potato cakes, these little fried devils are so tasty its is basically impossible to stop eating them. 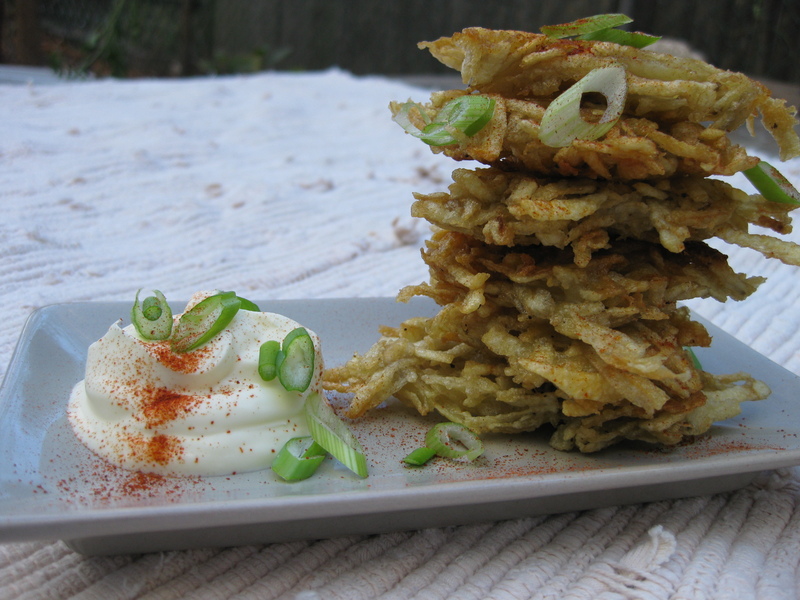 They are pretty simple to make, the one thing you must pay attention to is squeezing as much of the liquid out as you can, that will assure you will get a nicely crisped potato cake. As far as a recipe goes for these ones, I usually sort of eye-ball everything when I make them, mostly because you have to adjust the amount of the eggs and flour according to how wet the potatoes are, but here is a basic recipe to give you an idea of what to do.